With apologies for the short notice, we have had to cancel tonight’s junior training due to circumstances beyond our control. Junior training has now restarted for 2017 on Tuesday and Thursday evenings (for more details see the juniors page). Relevant news updates will be posted on the juniors news page in due course. Either click the links above, or type “juniors” in the search bar. Letters were also handed to all of the juniors at this week’s session requesting parents re-send their email addresses to Di (her contact details were on the letters), to ensure we have latest contact details together. Last junior training sessions before Christmas are Tuesday 13th and Thursday 15th December. Training begins again on Thursday 5th January and Tuesday 10th January. There will be no junior Thursday session for the next two weeks. From Thursday 27th Junior training is at the Vet Camp. Di will need all parent’s car details by Tuesday 25th as no cars will be allowed on site if their name and car details aren’t on the list. Tuesday training will be on as normal, meet for 6.15 start outside Argos. A fantastic evening, once again, at the Rainbows 100 lap challenge, with 3 teams of Striders joining in the competitive fun at this event which raises much needed charity funds for Rainbows. It has been great to see the numbers of juniors attending our training sessions steadily increasing recently. In order to ensure that all attendees can continue to get a quality session, please can any new runners contact Di Underwood (contact details on the juniors page) before coming along for the first time. Rapidly becoming one of the most enjoyable evenings on the calendar, the Rainbows 100 Lap Challenge once again lived up to its reputation. 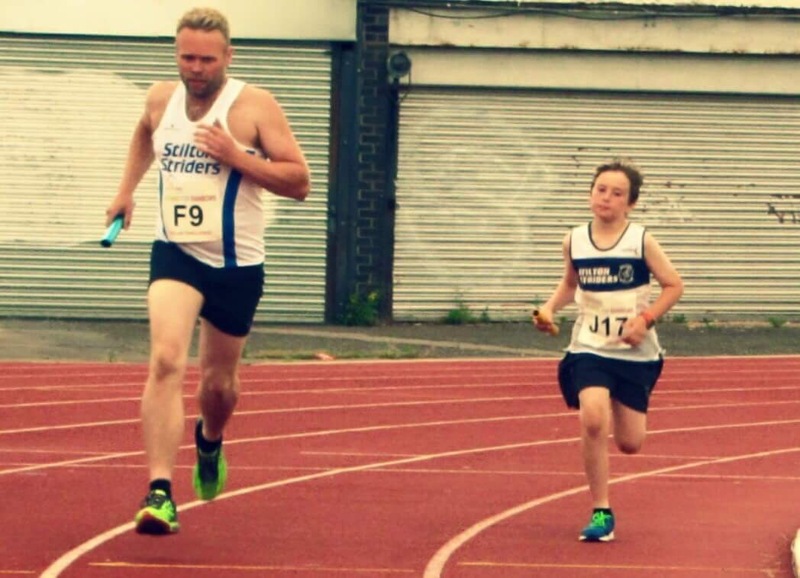 With mixed teams of 20 or so runners taking on the challenge of completing 100 laps of the Saffron Lane Athletics Stadium, the event has a great atmosphere, with huge amounts of support from all for runners from all the teams. With intermediate timings being announced over the tannoy, it was clear from early on that 3 teams had pulled away at the head of the field – Beaumont, Striders Seniors and, in an early lead, Striders Juniors. The three teams exchanged the lead several times and gaps of less than 1 lap of the track remained as the runners approached the 10 laps to go point. Ultimately, and for the first time in many years, the extra “experience” of our Senior team won through as they finished in first place, closely followed by the Juniors in second. A great night was had by all – same time, same place next year? My first time running this, in the past it sounded very much like a Scooby Doo type of thing “And we would’ve won if it wasn’t for those darn pesky kids”, in relation to our stunning junior Striders division. The Senior Striders team were up against not only our ultra fast juniors but Wigston Phoenix, Beaumont RC, Huncote Harriers, West End RC, Bowline CC, Desford Striders, Anstey RC and a Parkrun select. Just the small task at Saffron Lane Sports Stadium in Leicester of beating ever other team to running 100 lapsof 400 metres first. Started off by our shiny speedster Jason Barton we got the challenge underway, most interesting was thespeed of people who took off like a scolded cat for 250 metres then really felt the burn and tire in their legs. There were so many good runs and heroic moments throughout the night that I can’t chronicle them all here but will mention the forever humble Ian Johnson and Striders Lady legend Nicola Clay who just looked awesome every lap they did. The young showboating but totally speed on legs Alex Riley who may as I believe ran the fastest lap of the night. Michael Atton who found eternal stardom and notoriety with his alter ego “Chris”, it would be Striders and other clubs alike cheering in this wrongly named hero. I got to run five laps, I must say it gets easier after the first one where you sort of naturally go off too quick then feel like your sprinting up Snowdon the last 100 metres. Special mention to Stuart Gregory representing his second claim club Desford Striders (And running very well may I add) who came on saying we were on course to win the event. Captain Mike Bryan rang the bell for 99 laps as the Baton switched for Jason Barton who started the race for Stilton to run the 100th lap and bring victory to Stilton Striders senior team in the 2015 Rainbows 100 lap challenge!